that popcorn is the best! you can satisfy your sweet and salty cravings in one handful -- yum! And keep writing! I loved your "gateway quick food" blog. As a single person I totally know what you're talking about. It's a slippery slope. While this post is from November, that still makes it more fresh then these cans of pop corn come holiday season. This year my grandmother ostensibly bought one for me, but I really think she just wanted an excuse for a 55g drum of ick and a reason to have something metal decorated with lab puppies. 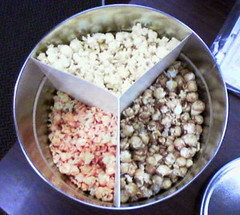 My dad used to get one of these tri-divided tins of flavored popcorn every Christmas. I remember the caramel corn always going first. The other flavors--cheese, as denoted by the Cheato-orange collor, and "plain"--always lagged in popularity. Have just been reading and looking through your blog. Excellent photos and cool design. There are so many food blogs these days and I can hardly keep up but have bookmarked this one. I started as a blogger myself and have just set up www.ifoods.tv for us bloggers to share photos and recipes and druve traffic to food blogs around the world. Hope to see you there and keep up the good work here on the blog. Cheers! This premium sausage, judged “a great-tasting must-try” by Better Homes & Gardens,” is available in variety gift packs that give you a delicious assortment of links and patties for a “breakfast Bonanza;” Hot and Sweet Italian Sausage for that “Tailgate Special” with your favorite team; a “Backyard Feast” of grilling sausage; and Flat Griller and Griller combo packs. Simply indicate when you would like the gift pack to arrive and order via our secure shopping cart and Pay Pal. The pack will be shipped in an insulated box to you or to someone special on your list, with a personalized gift card. Also, every 10-pack gets a FREE “Cooking with Uncle Charley” cookbook, a perfect stocking stuffer http://www.unclecharleyssausage.com/Uncle_Charleys_Cookbook.htm. Order now in time for the holidays.